Fall has arrived! I have a feeling the pooches appreciate the cooler weather. To make up for lost time (and because it was such a lovely day), I took out FIVE dogs when I was at Orphans of the Storm® last weekend. Before I start talking about the dogs, I want to thank Craig, another volunteer, for helping me and suggesting which dogs to profile! Two of the dogs I took out, Tanner the Black Lab/Pit/Mastiff mix and Sophie the Pit Bull Terrier mix, have already been adopted! Hurray, Tanner and Sophie! 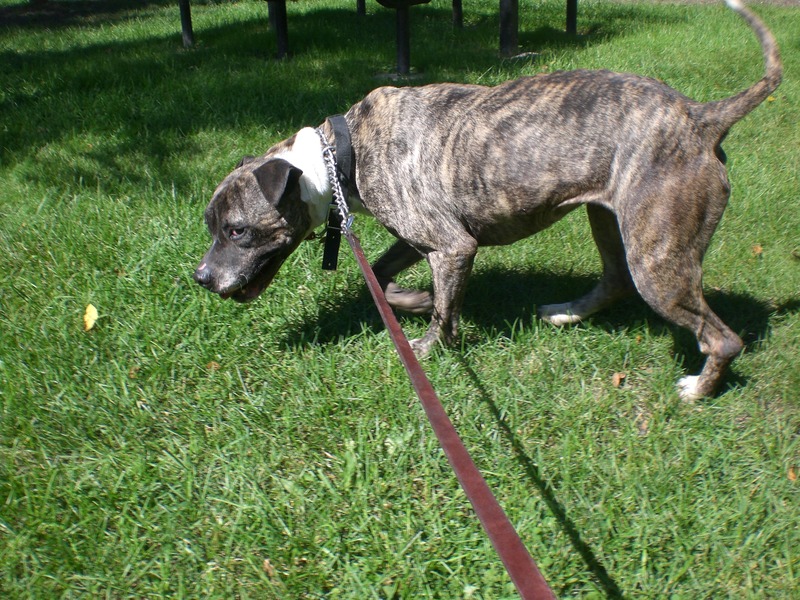 So, I will start with Bebe, a seven-year-old Pit Bull Terrier mix. 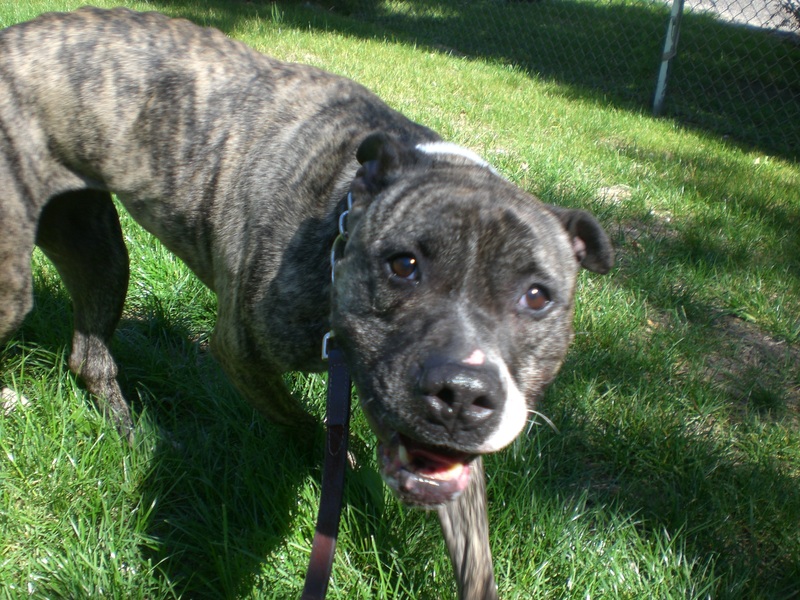 Bebe is a big, beautiful, brindle-colored girl who walked very well on the leash after getting her initial excitement out of her system. All I had to say was, “This way, Bebe,” and she followed me wherever I was headed. Bebe was affectionate with Craig, who she knows well, so you can be sure that if you bring her home, she’ll greet you with doggy kisses too! She also liked to explore. Maybe it was because she smelled the crumbs from people’s lunches, or maybe she just wanted some exercise, but she climbed right up onto the wooden table under the tent. 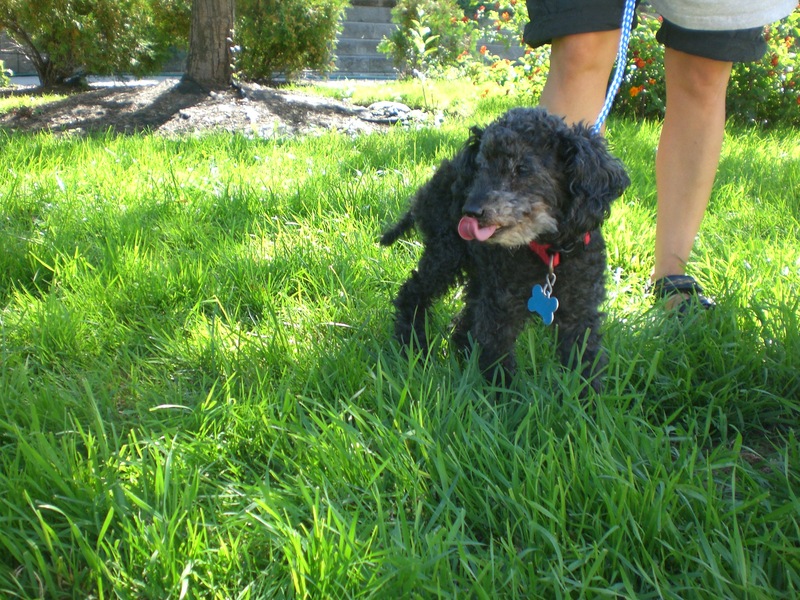 Bebe is a happy girl whose tail was wagging constantly as we walked around in the grass. If you’re looking for a big, affectionate dog who will happily climb onto the couch with you after going for a walk, come to the shelter and meet Bebe! 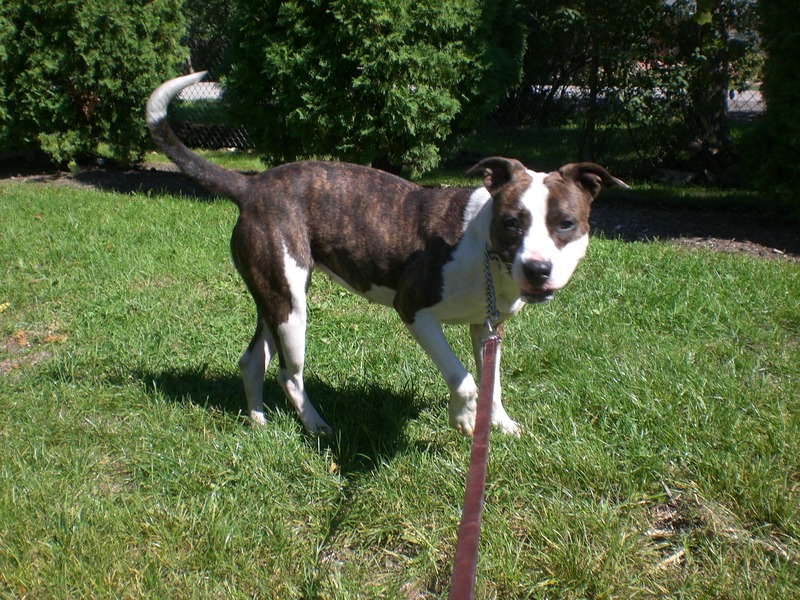 Nena is a two-year-old Pit Bull Terrier mix who is looking for her new “furever” home. She’s a little smaller than some of the other Pit Bulls at the shelter, and has an adorable face. Since Nena is still pretty young, there are definitely some new tricks she can learn, and she will be a fast learner! She currently has a habit of jumping up and putting her paws on your leg to say hello, but I would tell her “Off” and off she would get. With a few treats for positive reinforcement, Nena will go from “good girl” to “extra good girl”! 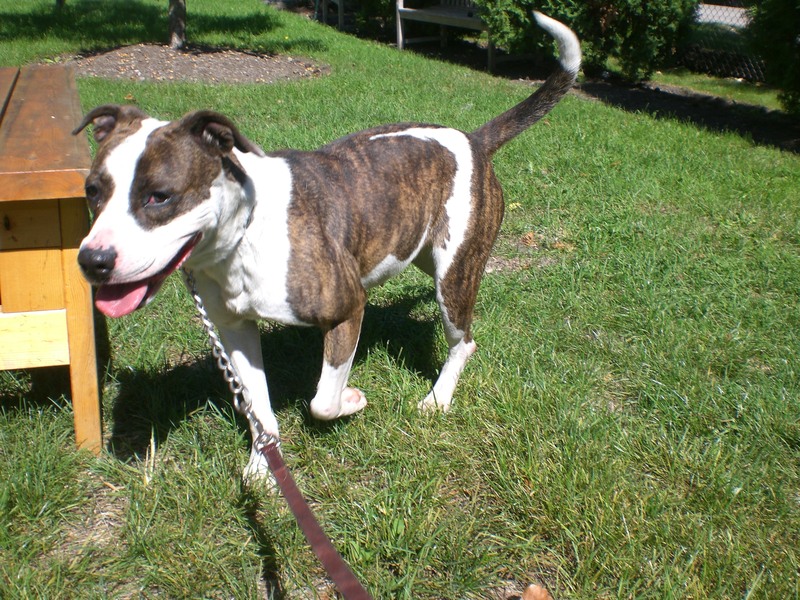 On your next visit to the shelter, stop by and say hello to Nena. That face of hers just might steal your heart. 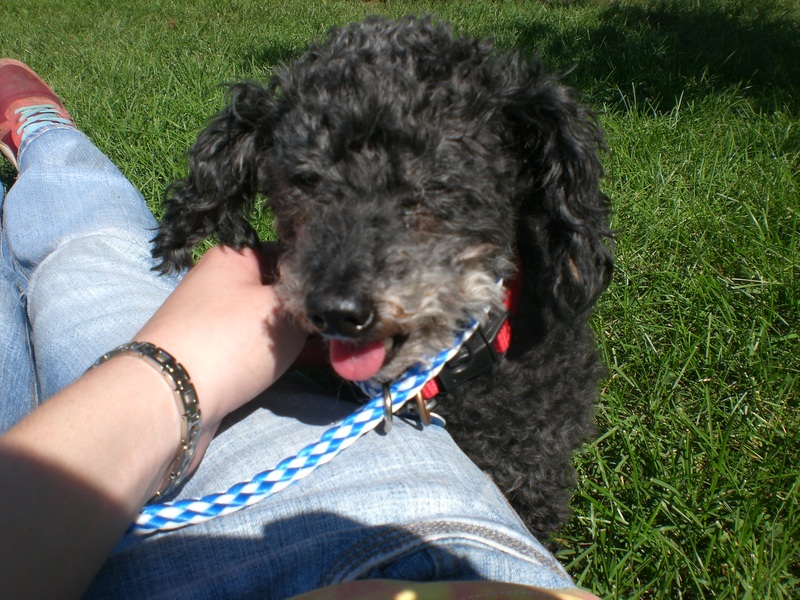 If you’re interested in a slightly smaller dog, Nugget the ten-year-old Poodle mix might be the one for you. As soon as Craig put little Nugget in my arms, I was in love. It’s hard to look at an adorable little dog like that without wanting to cuddle with it. Nugget isn’t available for adoption quite yet, but you can certainly come and meet him. Nugget has the cutest tail wag I’ve ever seen, and the funniest bark I’ve ever heard. It barely sounds like a bark at all. Since he’s a little dog with little legs, he doesn’t move very quickly and doesn’t need a ton of exercise. He would make the ideal lap dog. Even though Nugget is an older dog, he still has a lot to offer. His itty bitty tongue will give you itty bitty kisses, and even though I was a stranger, he settled into my arms very easily and didn’t mind me picking him up to put him back in his cage at the end of my visit. You’ll find Nugget right next to the front office. He’s ready for a new cuddle buddy! Nugget is ready for a lap to snuggle in! 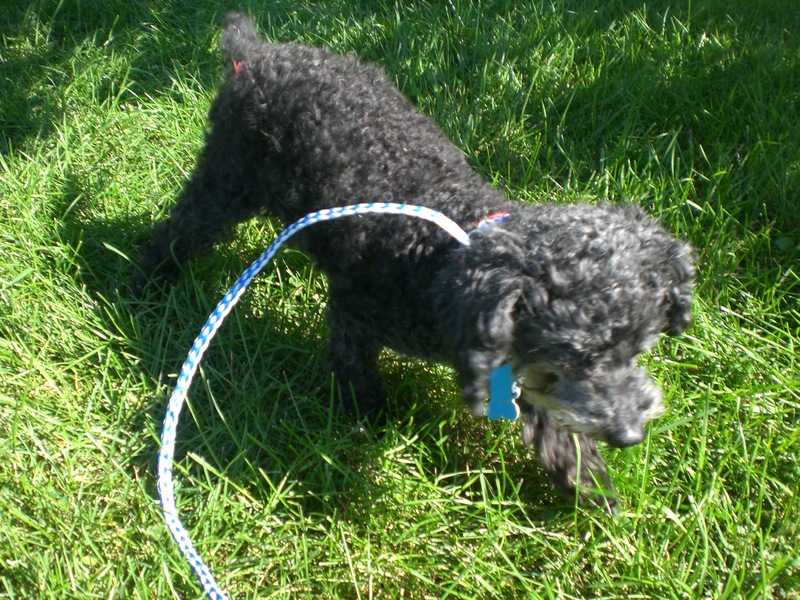 Posted by Meet the Pooches on September 20, 2012 in Dog Profiles and tagged adoption, animal shelter, Chicago, dogs, Orphans of the Storm, pets, Pit Bull Terrier, poodle.